Aldebaran, "The Eye of Illumination"
Aldebaran, the brightest star in the constellation Taurus the Bull, rises in the fall at sunset, and is the thirteenth brightest star in the sky. Its name comes from the Arabic Al Dabaran, the Follower, because Aldebaran appears to follow the Pleiades through the night sky. As the Eye of the Bull, Aldebaran is called the Eye of Revelation. It is referred to by astronomers and cosmologists as the Eastern Royal Star, one of the four Royal Stars considered the sentinels watching over other stars. It is also known as the Buddhas star, the Star of Illumination, and Gods Eye. This magnificent star has been used for centuries in navigation, and is known by many civilizations to be connected with the spirits of rain and the fertility of the earth. Approximately 5,000 years ago, the rising of Aldebaran marked the vernal equinox (1) and marked the beginning of the Babylonian new year. The Hindus referred to Aldebaran and Taurus as Rohini (the Red Deer), the name of the river in Nepal where the Buddha was born at the time of the May full moon, around 563 BCE. Another Hindu name for Aldebaran is Sataves, which translates to the "leader of the western stars." Pale reddish-orange in color, Aldebaran has a companion red dwarf star that shares its motion throughout space. Located slightly south of the ecliptic, in the path of our earths moon, Aldebaran has a magnitude of 1.2 and is one of the few 1st magnitude stars the moon may occult. Approximately 40 times the size of our sun, Aldebaran is 68 light years from the Earth, and is about 3 times the brilliance of Polaris, our current North Star. 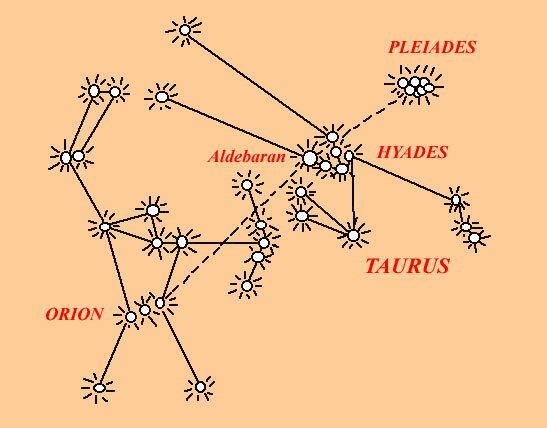 In addition to the star Aldebaran, there are two other very beautiful and famous star clusters in the constellation of Taurus: the V-shaped Hyades at the head of the bull, and the Pleiades in the shoulder. To locate Aldebaran or Taurus, follow the line of the three stars that make up the belt of Orion; they point directly west toward Aldebaran. Look up during the fall and winter months just after sunset, and youll see Orions Belt and Aldebaran rising in the east, traveling in a northwesterly direction. Aldebaran, the star of illumination, is directly across the zodiac from Antares, the star of anger, pride and revenge. In the only exact opposition of two major stars; Aldebaran is located at 9 degrees of the sign Gemini, with Antares at 9 degrees of the sign Sagittarius. Aldebaran is said to be a portal to the mysteries of the mind and when balanced with the fixed star Antares, a portal to the mysteries of the heart, this creates a powerful stargate axis that is illuminated bi-annally when the Sun passes by Aldebaran at the first of June and then Antares about six months later. Recently Pluto passed through the constellation of Scorpio and conjoined Antares, also known for its transformative qualities. Pluto visits Scorpio only once every 248 years. During its sweep through this part of the zodiac, Plutos orbit brings it closer to the Sun than Neptune for approximately 20 years. Pluto is a dynamic force of creation and destruction. Pluto, the first ray planet of will power and purpose in our solar system assists in the destruction of the lower desires so that more highly evolved qualities can be expressed by the human being. In the destruction of old forms ~ be they physical, astral or mental ~ Pluto literally changes their atomic structure. Pluto causes major changes and forces the transcendence of personal desires into a more universal orientation. Pluto is the planet of death and rebirth. It personifies the destruction of things whose time has come to an end, and the regeneration of what is new. It is like decaying autumn leaves becoming nutrients for the spring; the caterpillar changing into a butterfly. It is the transformer that stimulates and catalyzes the Will. For more about Pluto and the quality of Transformation, click here. In stellar myth, Aldebaran is Vision Holder for the starseed mission on Earth, defining what emissaries of light can best accomplish to serve humanity through evolutionary transition. In down to Earth terms, Aldebaran holds the vision for global leaders and world servers, inspiring the administrative planning of world affairs, specifically for physical logistics and a global infrastructure designed to support humanity through evolutionary unfoldment and global change. 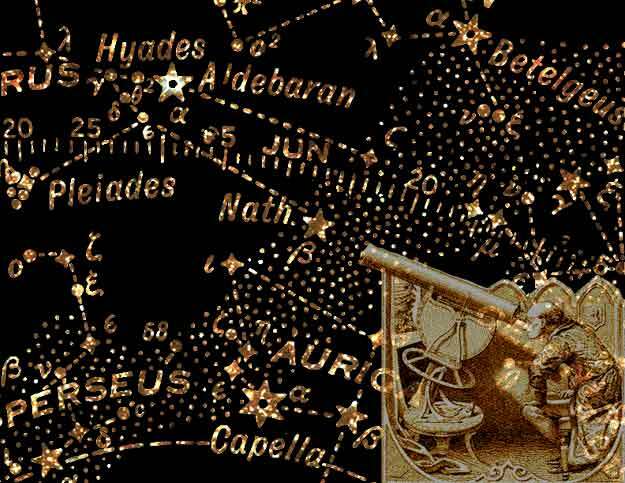 Prominent alignments with the Aldebaran / Antares axis can express into the political and global arena. The visions that many people attune to regarding alternative living centres, educational centres, emergency preparedness programmes, etc., are parts of the inspiration from this star’s emanations. Aldebaran can indicate involvement with physical places and projects supportive of alternative modalities of living. It inspires business that supports family. 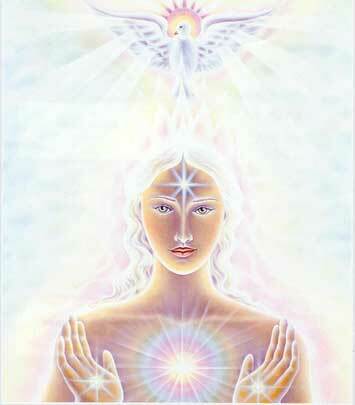 Aldebaran inspires us to take the physical action required to manifest our visions. In the sign of Taurus, when desire is transmuted into aspiration, darkness gives place to light and illumination. 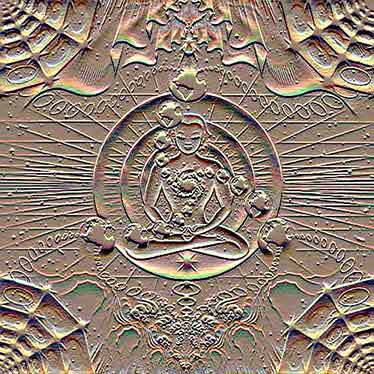 The eye of the bull, the spiritual third eye or the "single eye" of the New Testament, is opened. "If thine eye be single, thy whole body shall be full of light," said the Christ (Matthew 6:22). This single eye takes the place of the two eyes of the personal self. (3) As the attention of humanity becomes focused upon spiritual attainment, we tread the Way of Revelation. Revelation, as defined by The Dictionary of Scripture and Myth, is a "symbolic communication from the higher nature to the lower, imparting truths of the invisible universe and the soul. As revelation does not and can not arise from the lower nature, it is self-evident that the lower or objective mind of man does not compose the revelation, but is merely the receptive vessel into which the Divine message is poured." As the star of illumination, Aldebaran irradiates the Way using the applied power of transformation. In seeking illumination, we can cultivate the ability to use the mind as a reflector of soul light. (6) An increased understanding about the process of revelation may help us comprehend the quality and significance of Aldebaran. One way we receive revelation is through contact with the soul. The more consciously we desire, demand and will such contact, the closer we are to receiving the next needed revelation. How clearly we perceive the revelation depends on our ability to still the mind and listen to the voice within. One of the most difficult aspects of our service is to understand correctly the precipitating truth, information or revelation that is being impressed. We need time to absorb the revelation and incorporate it into a useful present time form. How does one become a living example of this divine understanding and better understand the significance of the star Aldebaran? 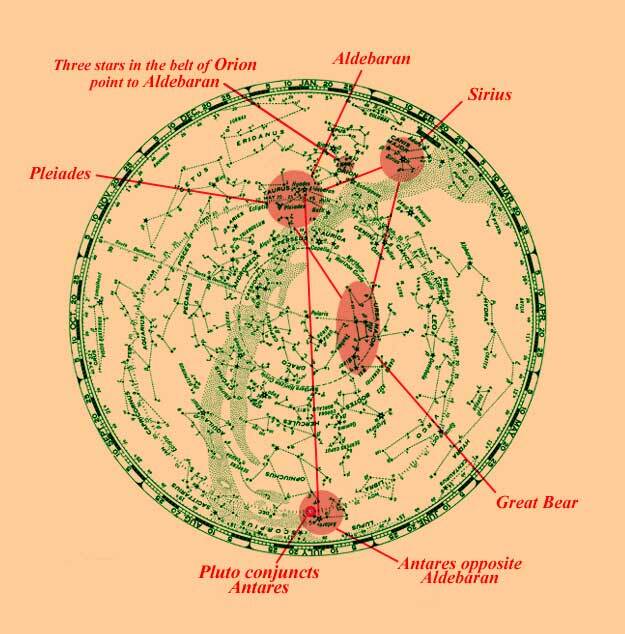 One suggestion is to meditate on the triangle created by the Pleiades, the Great Bear, and our solar system. Imagine the pathway the energy follows to reach our Earth. See the energy of the Will as a brilliant golden light emanating from the constellation the Great Bear. Visualize this light flowing to one of the seven stars of the Pleiades, observe the star it is naturally magnetized toward. Know the energy is being slowly stepped down in vibration as it reaches this star. Watch it leave the Pleiades and enter into our solar system. Visualize Aldebaran, the star of illumination, focusing like a lens the light force, Fohat, the Active Intelligence, to the Earths North Pole. Then see this force being absorbed by the Soul of Humanity. Visualize a golden thread of light entering the top of your head, and open to receive revelations and insights about your purpose in the divine Plan. When the energy of the light force is released to nations, races and individuals it produces two effects: the increase of the self-will, demonstrating as cleavages, separate desires, goals, or ideas of a nation, state, family or the individual, without regard for the need of the whole. The second effect stimulates the Will-to-Serve the Plan, the whole, and produces unity and harmony, beneficial to the entire process of evolution. (very close to the constellation Aquarius), the Southern Royal Star.